Pet Wellness Month : Dedicate This October To Your Furry Angel! Your pet’s health is one of the most important assets for them as well as for you. Spending time, playing and caressing are the gestures effective for their mental wellness, which is also proportionally related to physical well being. A healthy mind has a great impact on individual’s body and vice versa. Especially, your pet demands your attention because he/she cannot express the pain or the happiness through verbal strings. They rely as well as admire you for their health status. You follow a custom of dedicating a certain month, week or a day to specific relationship or any random social cause, which creates awareness among the crowd and draw their attention to a specific area. What, if you dedicate a whole month to your lovable creature? Doesn’t it sounds great?? Yes of course, it is a great idea to show more love and affection towards your pet! As, they are the most reliable friend, terrific partner and loyal companion. October is celebrated as National pet wellness month! It feels so great to have such kind of celebrations for your pets. Are you willing to be a part of this?? Then you are at a right place. Pet’s Health is a major issue from a long time among pet parents, now you have a opportunity to invest your energy into this for improved health of your lovable companion. For your pet’s safety you will come across many do’s and don’ts. Start with the key of good heath! Yes, vaccines are like safeguard against many hilarious situations. So, start keeping a record of all the vaccines which are administered previously and apart from that, make a new list of vaccines, which are meant for their future’s safety. Proper vaccination should be ensured primarily. Protect them against scary creatures!! Fleas and ticks have a great potential to disturb your pet’s health. Try to use best fleas and tick preventive product for your pet. Spraying and neutering comes under best treatments for preventing pets against pests. Take help of some professional or take guidance where ever you need. Concept of healthy and safe food should be stressed on pet’s wellness month, as food being necessity of life should be harmless and non allergic for them. Poor oral hygiene!! Get rectified with all the dental issues of your pet. Dental problem should be treated before they become hazardous. Obesity comes under a serious problem among pets. Approach a dietician to get insightful suggestions to balance the body weight of your pet. Proper weight management is a key to a disease free life. Special check ups!! Apart from the routine check up. Firstly, select a pet friendly vet and take appointment for a checkup. Be a part of this festivity! 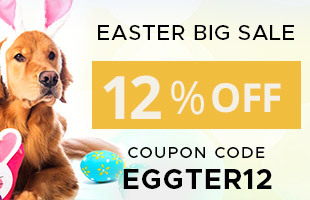 Just by giving your incredible contribution for better health of your pet. Try to fill this October with lots of surprises for your pet. Most importantly, give them a gift hamper of good health. 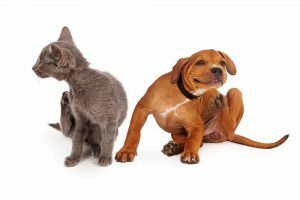 Never Allow Fleas To Proximate Your Pet ! “Blood suckers” are very excruciating for pet’s as well pet owners. Now you must be thinking to whom does this designation suits. In any case, if the first thought in your mind is fleas!! Then you are absolutely correct. Fleas are the scariest for our docile pets. Not everybody, but majority pet owners can relate to this. Once you discovered that your pet has fleas! Now, what next?? Bunch of people will get concerned about this and rest will take it as a normal pet’s problem. Never!! This problem is critical and need your assistance to get normal. Otherwise, considering it as a normal problem can further add more hurdles in path of your pet. Now the question arises, why so much stretch on cleaning?? Cleanliness is the basis of healthy life. Whether it is you or your pet, sanity should be the priority in each and every aspect of your life. Bathing and sun drying should be alternatively done, to maintain hygiene. Product selection is a tactful task. Markets are over flooded with ample of products having potential to combat fleas’ infestation. The thing is, outlook to select the most suitable product for your pet. To add some quality products, Merial brought a big range of frontline products. Frontline products include Frontline Plus, Frontline Spray and Frontline Top Spot. All these products are designed to get rid of fleas, flea eggs and flea larvae from the dogs. They also prevent re-infestation of these parasites on the dog. They work effectively even when the dog is in water or bathing as they are a water-proof treatment. These remedies will cure and protect your beloved pets from getting any serious health issues from the fleas. You can also use flea combs and fleas shampoos especially designed for dogs who are prone to flea problems. 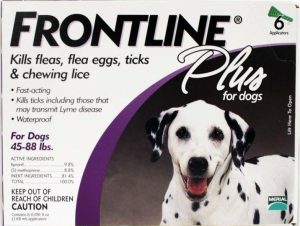 Frontline spot on is a promising option to curb fleas from your pet. Order it now !! Select The Most Compelling Product -Nexgard Vs Frontline Plus? Selecting anything best for your pal is a great responsibility accompanied with lots of daunting factors. Fleas and ticks creates frustration among pet parents, being responsible for making their pets scratchy and weak. Let’s start with the factors that can be controlled by your meticulous efforts. On a very primary level you have to help yourself as fleas and Ticks control is also based on the personal efforts which one make continuously for their pet’s safety. If your pooch is an outdoor lover, ensure you are checking him properly. The modern era of advertising and digitization is making it easy by endorsing ample of products which are proven safe with rapid action and instant relief. Markets are almost burdened with all the old as well as newly marketed product Propaganda of digital world has confused people a lot. Choosing any random product irrespective of the skin conditions of your dog can be quite menacing. So, in short don’t be a copy cat!While choosing a flea/tick preventative it is important to consider you and your pet’s lifestyle. There are many factors that could contribute to the decision of which option is best for you. Age, species, breed, health status, and any current medications should all be considered. All the flea/tick preventatives are medications and any new products should not be started without first talking with your veterinarian. Familiarize yourself with some glimpses,which should be under your considerations while selecting a product for your pal. Searching an appropriate product is a very daunting task!So,to reduce the inconvenience in the path of selection,you should trust make selection based on comparative studies. Here you can get wide range of product with their qualities and superiorities. Stay acquainted with all the pros and cons of these product. Frontline Plus and Nexgard are two top most products for fleas and ticks.They are powerful deterrent property.Now, question arises which should be selected out of the two? What does this product protect my pet against? How long will it take for the product to begin working? What do I do if my pet seems to be having a reaction? Does my pet need to be on more than one product? If I see a flea or tick, does that mean the product isn’t working? The active ingredient in Nexgard is afoxolaner,which absorbs rapidly into your dog’s bloodstream and over-stimulates the central nervous system of fleas and ticks, causing 100% elimination within 24 hours. Nexgard is effective towards various species of ticks,especially the american dog tick. Frontline has active ingredient known as fipronil. Fipronil sits in the hair follicles and is released slowly over time. Nexgard is a flea and tick product of its kind because it comes in a yummy, beef-flavored soft chew,this provides two advantages that you get rid of all the messy applications and no fear of licking by pets,in short a safe formulation that protects your dog from flea and tick infestation for a full 30 days. Whereas Frontline is a topical treatment spreaded all over the pet’s body. It is completely waterproof!! So,no worries. So, here Nexgard wins arguably, as tablets are ways safer than topical treatments. And secondly, it can be preferably used by pet parents seeking a product to work effectively against American dog ticks. With great power comes great responsibility and with sweet four-legged doggies comes a much greater responsibility of their health, happiness and safety. Their life is a one hundred percent your responsibility, so plan accordingly. “Responsibility Educates.” – Wendell Phillips. Standing up to the above quote isn’t as easy as it sounds. When you take up someone’s responsibility, you have to make yourself aware of all the possible threats they must be kept away from and what are the things that makes them elated. 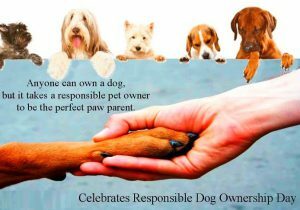 On the occasion of Responsible Ownership Day, you must remind yourself to adhere to the promises you made to give a contended life to your pooch. Opting to do the right thing by adhering to those promises and become a responsible dog-parent is the best you did. A study recently revealed certain points that need to be adhered to if you are an awesome dog parent. These will give your pooches a warm, contended, fit and secured life. Dog parents must know about spaying and neutering process. For those who are not aware about what does spay and neuter means, these are the procedures to control population of pets. Moreover, it ensures a healthy and elongated life for the pets. Spaying prevents various urinary infections while neutering prevents cancer and other health hazards. To ensure the security of your pet, always get them micro-chipped. Now a days, just tagging an ID on the dog’s collar is not enough for their safety. If your dog by mistake gets lost, anyone has the liberty to remove the collar and you might never find him again. To avoid any serious repercussions like this, micro chipping is the best way to safeguard the pooches. Digitalization is an integral part of our lives today, so consult your vet and get your doggy micro-chipped. Never compromise with the health of your pooch. No matter if you think he is perfectly fine; still take him for an annual veterinarian examination. All the signs of infections and diseases are not necessarily deciphered from the dog’s behavior. Internal health speaks a lot about the fitness of the pooch. The vet will perform all sorts of tests on the dog and hand over the results. If your pooch is doing well, then just routine flea, tick preventatives and heartworm treatment will keep going on. If the vet has any new findings, then he’ll suggest some new treatments or change in diet accordingly. For any sort of emergency, natural or unnatural you must keep a dog’s first aid ready. While travelling it is also handy to carry a first aid with all the necessary treatment and precautions. Food, water, wound care treatments and other essentials must be stocked in the emergency box at all times. Responsibility is a big word not just in the means of number of letters but the depth that the word carries is huge. Being a responsible parent is not to show to the world of your good deeds but to provide a healthy and contended life for another being i.e. your doggy.